I'm now counting down the days before I head off to Yunnan to do a solo hike to the unexplored Gongsenlongba glacier on the west side of Kawakarpo. As I've said before, this is a bit of a challenge because it lies in Tibet - so I will have to access it in a discreet way from the Yunnan side of the mountain. Thanks to Google Earth, I have found a clear route from the Mekong (Lancang) side, which appears to have several shelters/huts en route. This basically follows the kora in reverse for a couple of days, then diverts south after the Shola Pass (ie on the Tibetan side) to go across country towards the lesser 6509m peak Cogar Lapka. The glacier lies between this peak and another called Godanilaka (see the excellent map by Tomatsu Nakamura above). I'm pretty much kitted up and ready to go. Unlike my last trip to Yading, I'm doing this one with little preparation and even less cash. I'm on a very tight budget, so won't be buying any new gear - just the same tatty old kit that has got me through the last few trips. The only thing I might splash out on is a porter/guide. Being 53 years old I'm getting a bit old for this kind of thing, ie lugging a 12kg bag up a steep slope at 4000m ... but I'm worried that I won't be able to find any local willing to go along this off-the beaten track for a few days. If the worst comes to the worst I'll just have to go alone drag the bag up there myself, very slowly. I'm not keen on going solo, but all the prospective trekking companions have dropped by the wayside, for various reasons. Very well then ... alone! I've learnt from my last trips to keep the gear to a minimum. On my Yading trip I found that I could survive quite well on a diet of cheese and crackers for lunch and some instant noodles for dinner. So that's pretty much all I'll be taking. My other big worry is getting nicked by the authorities for being in Tibet without a permit. This is most likely to happen when I drop down to the western side of the mountain on my 'exit' stretch of the hike. 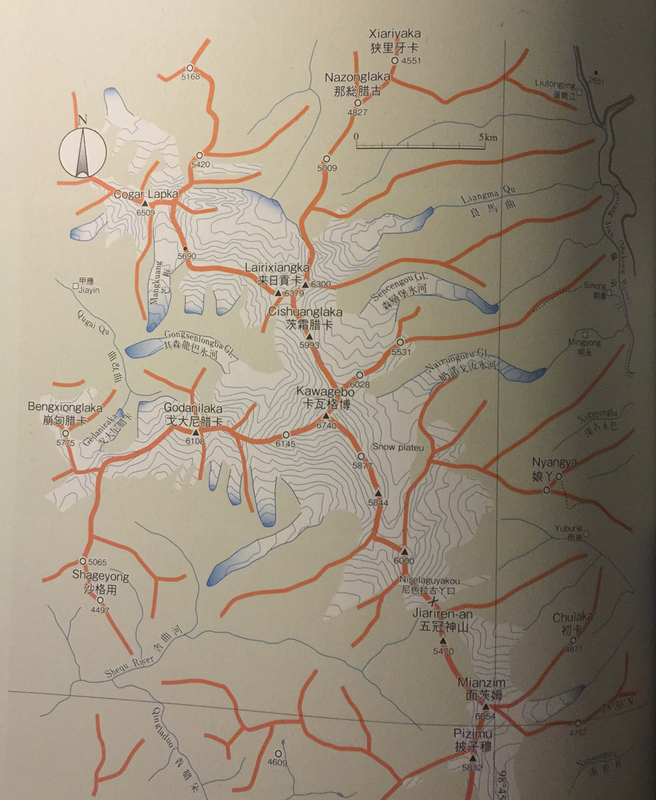 I plan to try sneak through Chawalong and head down along the Nujiang out of Tibet and back into Yunnan to Bingzhongluo. I've done this route twice before and managed to evade the police/army checkpoint south of Chawalong by travelling at night. This time I'm taking a slightly different approach - I will be hiking on the other side of the river. Google earth shows that there are a bridges about 3-5km either side of the checkpoint, so it's just a case of crossing and walking on that side, keeping a low profile (touch wood). As part of my research into this delicate matter I've found a Chinese hiker's blog on which he has posted a photo of an official notice pinned on the checkpoint showing its opening times and even the phone numbers of the police on duty! Maybe I can use this info to distract the cops at a crucial moment while I leg it. To get back to the Lancang/Mekong I'll be re-doing the wonderful Dimaluo-Cizhong trek. In the footsteps of er, Kingdon Ward (who did this trip in 1922, as described in Mystery Rivers of Tibet). Just found your page. I've been around the areas you write about quite a few times in the past 15 years and keep coming back, wishing to do a longer trek one day, like Lugu Hu- Yading or the Yading kora. Wish you very good luck with this new adventure! Great blog!